Recently I downloaded the Ebook of "Bulfinch's Mythology: The Age of Fable" by Thomas Bulfinch. I have a resolution to expand my scope in literature by reading and rereading classics in my spare time. I may not have someone who is interested in discussing literature with me.... except my sisters who are currently away in school... but I think I can be satisfied with just reading them for now. For most people, classical literature makes a boring read and seems to have no relevance to today's lifestyle. I thought so too but after stumbling across and reading a copy of "Pride and Prejudice" by Jane Austen, I've come to the conclusion that the behavior of people in those days are really no different from those I observe today. 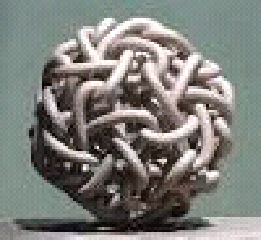 My main topic is derived from the mythical tale of the Gordian knots and I have decided to see in it a proverb concerning the knotty situations in our lives. We are all faced with different types of knots in our life....a big shoutout to natural haired divas who have battled with Single stranded knots, Fairy knots and the great big knots that has been a clog in the wheel of length gain! Many have used the ancient solution to knots without realizing it! LOL! So before I blab any further, let me get down to the main story. "Midas (the king with the golden touch) was king of Phrygia. He was the son of Gordius, a poor country man who was taken by the people and made king in obedience to the command of the oracle, which said that their future king would come in a wagon. While the people were deliberating, Gordius with his wife and son came driving his wagon into the public square. Gordius being made king dedicated his wagon to the deity of the oracle and tied it up in its place with a fast knot. This was the celebrated GORDIAN KNOT, of which, in after times was said that whoever should untie it should become lord of all Asia. Many tried to untie it but none succeeded till Alexander the Great in his quest for conquest came to Phrygia. He tried his skill with as ill success as the others till growing impatient........he drew his sword and cut the knot! When he afterwards succeeded in subjecting Asia, people began to think he had complied with the terms of the oracle according to its true meaning! " - culled from Bulfinch's Mythology: The Age of Fable" by Thomas Bulfinch. The lesson here is that when faced with an almost impossible problem that may seem to have no solution be in our careers, educational pursuits, our spiritual lives, our relationships .......and even when caring for our natural hair *I just had to put that one in, hadn't I?! *........we should try to think outside the box! Inspire of what we've been taught, there are really no hard and fast rules about dealing with knotty situations we may face.............. and naturalistas know the only real solution to those pesky SSK's is to do the Alexander and chop them off! So if a situations tries to get the best of you, think outside the rules. Think outside of what he said or she said and you'll be able to see clearly the solution to that ish! Think outside of your office cubicle to how the role you play really helps the smooth flow of the business enterprise as a whole. Think outside of your 9-5 job and see how you can improve yourself. That may be the solutions to the feeling of discontent and apathy you face in your work place. Think outside your perceived weaknesses and you may find your strength. I can go on and on.... but it means I'll selfishly not be able to hear about your own ways of dealing with "Gordian knots " in your lives! So please do share! Have a question or comment? We would love you to share!!!! Natural Hair Blogger. Crazy Igbo Scientist. African Salad Lover. MY HAIR DRINKS ZOBO....WHAT DOES YOURS DRINK? WHAT'S IN MY MAKEUP BAG? Simple, Easy Natural Hair Care!! !